The boatmen in the song can be heard chanting 'Ya peer Dastgir', which is like the traditional chant for Kashmiri boatmen and the muslim working class. 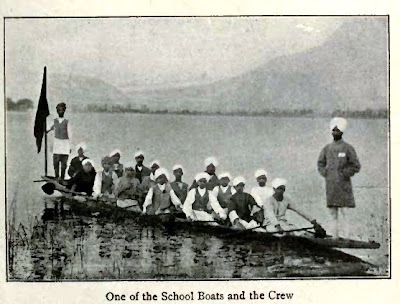 Also, the probable reason why we see more than two men rowing those boats is that around that time regattas organised on Jhelum river and Dal Lake by Christian Missionary School were an important part of the Srinagar experience. Koshur British Rhymes: "There is indeed a "nursery rhyme thrill", a certain Hickery-Dickery-Dock patter of rhythm, which anyone can hear (as Aldous Huxley heard it) any time, of day, in the streets of Kashmir..."